Joey Silvestera the owner of this beast is no newcomer to motorcycles. He grew up racing dirt bikes as a kid, so when he moved to New York to start his business Blackstones (great website) he decided it was time to get a bike for running around in traffic. He decided to call Duncan MacDonald at Lucky Charm Choppers to discuss a brief. Joey really wanted a Harley but also needed it to be compact and tight to race around NY streets. Luckily, Duncan had the perfect C & J flat tracker racing frame that had been sitting in his garage for 15 years. After a bit of begging, Joey convinced him to sell it. 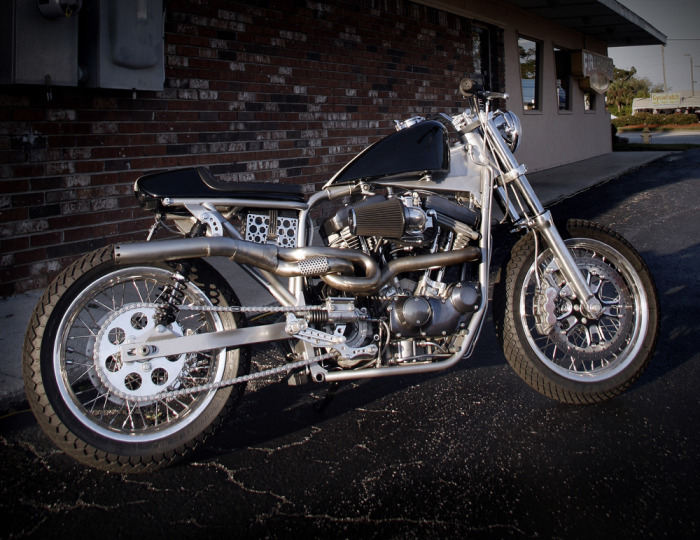 Then Duncan came across a wrecked 1996 Sportster, pulled out the motor and the build began. Over the next 4 months Duncan and his team created this stunning streetfighter with a spec sheet too big to mention here. Joey has decided to put this bike up for sale to start another project so if your like what you see you can email Joey Silvestera and he’ll be happy to give you all the details and price.